2019 Fiesta Jazz Festival featured artist, Rufus Reid and his quartet. Rufus Reid, composer and premiere bassist on the international jazz scene, and his quartet from New York City will headline the 57th annual Fiesta Jazz Festival, Friday, April 26, and Saturday, April 27, at St. Mary’s University. Enjoy national, regional and local musicians at this free Fiesta event, one of the oldest jazz festivals in Texas. The St. Mary’s University Music Department and a grant from the John L. Santikos Charitable Foundation of the San Antonio Area Foundation sponsor the event. Twice nominated for Grammy awards, Reid brings to the festival an extensive jazz background and a discography that reads like a Who’s Who in jazz. He has shared musical moments with the likes of Gene Ammons, Kenny Dorham, Eddie Harris and many more. 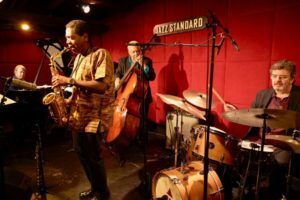 In addition to Reid on bass, the group also features Steve Allee on piano, Duduka Da Fonseca on drums and Yosvany Terry on saxophones, who was Grammy-nominated for his Latin jazz album New Throned King. From 1990 to 2001, Reid co-led a quintet with Akira Tana, releasing five CDs. Reid’s more recent foray into composing earned him the Charlie Parker Jazz Composition Award for Skies Over Emilia. His 1974 book, The Evolving Bassist, continues to be recognized as the industry standard as the definitive bass method. On Saturday, the Fiesta Jazz Band Festival will run on campus from 8 a.m. to 6 p.m. in the University Center and Treadaway Recital Hall. More than 30 Texas middle and high school jazz ensembles will take the stage. They will perform in front of a panel of jazz educators, who critique the ensembles and award trophies for outstanding performances. Reid will hold a jazz clinic at noon in the University Center. The Jazz Orchestra of San Antonio will perform at 5 p.m.
All events are free and open to the public. Parking is also free. Food and drink will be available for purchase. Contact jazzfest@stmarytx.edu or 210-436-3421 for more information.